The following is from a post by Grant Richter of Wiard, makers of some of the most revered modular synths, sent to the Wiard list. The people who make printed circuit boards are used to doing most of these operations to a higher degree of precision and more quickly and cheaply than machine shops. If the buying public was willing to accept faceplates made from fiberglass instead of metal, it would open the floodgates to new module designs. You can hardly see the difference either, the fiberglass is painted and silkscreened just like the metal. Plus fiberglass is lighter and stiffer. I have heard this idea repeatedly from many people, but no one believes people will buy modules with fiberglass faceplates. It is not historical. There are also design advantages to PC material faceplates. The faceplate can become part of the circuit. Touch switches for triggers or mode selects are essentially free. Things that are expensive in metal, like slots for linear pots or perforated grills for speakers, now cost a few pennies instead of a few dollars. It is a practical idea, but the world is not yet ready for it. Wiel’s Time Capsule (in an Electric Storm) is a blog that features rare old out of print records available for both download and streaming. 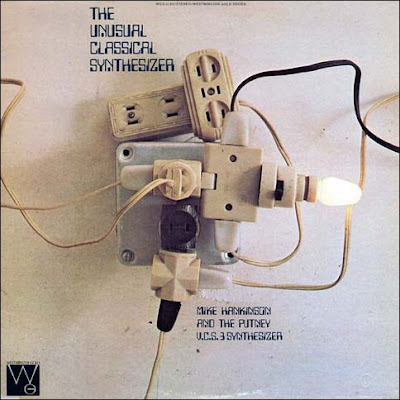 Recently there have been a number of works featuring just one synthesizer. The most current album, Mike Hankinson – The Unusual Classical Synthesizer, pictured here, features the EMS VC3S or Putney. “So what is a ‘Welsh Minimoog’ then? Moog Music Ltd., based in Caerphilly, Wales was set up in the 90’s to reissue Moog Modular parts before setting out to recreate the classic Minimoog… with a few enhancements! From what I understand, only five Minimoog Model 204Es were made before the company went under. I was lucky enough to acquire one (cost Â£1500 at the time!). Ultra-stable oscillators – these have yet to go out of tune in eight years. Transpose switch – the range of the keyboard has now been increased by +/- 1 octave. PWM on Oscillators 1 & 2 when they are set to Square/Pulse waves. Osc 3 in LFO duties provides modulation. Multiple Triggering – the envelopes can be set to multiple triggering, in addition to the original’s single triggering. The Model E by Don Martin is commonly referred to as the Donimoog. Bob eventually won his name back in the US in time for the Voyager. You can read a short letter sent to MMR back in 1998 that alludes to a new Minimoog in the works and his thoughts on Don Martin, here. In the UK, Alex Winter retained rights to the MOOG name and the Voyager was released as the Voyager by Bob Moog. Peter Forest, of the widely known VEMIA auctions and author of the A-Z of Analogue Synthesizers (link), noted that a recent advertisement had the Voyager listed as the Voyager by Bob Moog and the Little Phatty as the MOOG Little Phatty. Word has it that MOOG Music has regained the rights to use the MOOG name in the UK however, the Minimoog name may still be owned by Alex Winter. You can find some samples of the Minmoog Model E in here. For daily synth-related posts check out Matrixsynth. OS X 10.4.9 Breaks Some Audio Unit Plug-ins?